Learn to create deeper connections to your work onstage and with your audiences. Analogous initiations can elevate your play to new heights. Jessica Makinson will teach you to retrain your brain to create strong, meaningful initiations from story based openings that guide your scene partner into giving you the support you're aiming for. Workshop attendees will learn the Armando style form using self generated monologues to practice different kinds of analogous initiations in the hopes of creating commentary and a dialogue between the players, monologist and the audience. If your interested in the Armando form or want a deeper connection to your improv and you are an intermediate to advanced long form improvisor looking to take your work to the next level, this workshop is for you. ​Jessica Makinson is a proud alumni of iOWest and UCBLA. Performing in Los Angeles since 2001, she played with The Armando Show at iOWest for 10 years. She currently performs with the traveling group Theme Park Improv at festivals around the country. 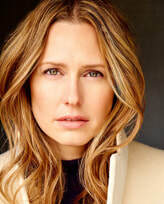 Jessica's TV credits include improv based shows "Halfway Home" and "Trigger Happy TV". She can currently be heard doing voices on "South Park" and seen on "Fortune Rookie" for IFC.com.